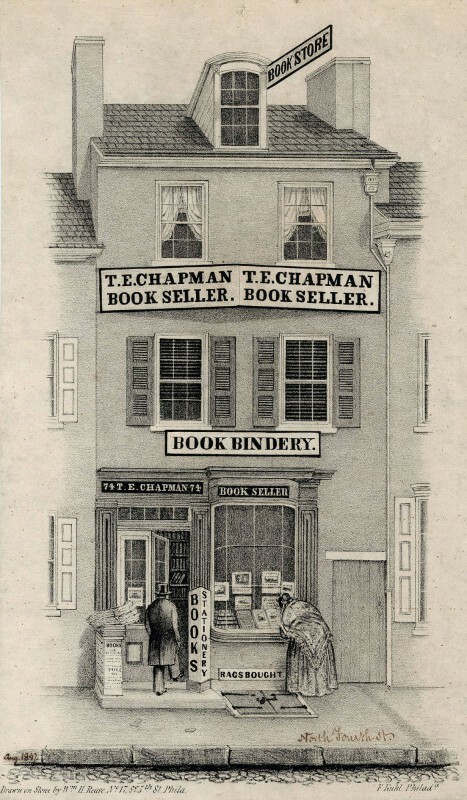 This detailed illustration by Frederick Kuhl served as an advertisement for Thomas Ellwood Chapman’s Book Store and Book Bindery at 74 N. Fourth Street. 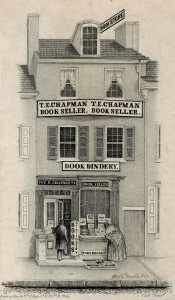 Chapman opened his store in 1840 and the book bindery in 1843, relocating in 1849. This image was produced as a lithograph on a stone plate in August 1847. This illustration of W.A. 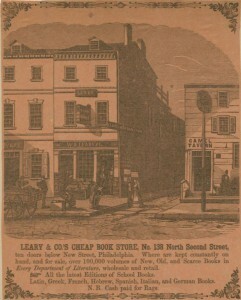 Leary & Co.’s Cheap Book Store (in its original location at 138 N. Second Street) advertises the three-story building with book displays positioned in front, along with several shoppers. Leary’s Book Store was a very popular location for Philadelphians in the mid-nineteenth century, and writer Christopher Morley would be inspired by Leary’s to write his mystery novel The Haunted Bookshop in 1919. Leary’s offered a variety of books. The text below this advertisement reads, “Where are kept constantly on hand, and for sale, over 100,000 volumes of New, Old, and Scarce Books in Every Department of Literature, wholesale and retail. All the latest Editions of School Books. Latin, Greek, French, Hebrew, Spanish, Italian, and German Books. N.B. 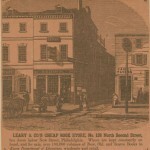 Cash paid for Rags.” Leary’s would relocate twice, but the business did not experience great prosperity until former employee Edwin S. Stuart took over in 1876. Stuart went on to become mayor of Philadelphia in 1891 and governor of Pennsylvania in 1907. By 1950, Leary’s sold upwards of 40,000 books per week. It was in business from 1836 to 1968, making it one of Philadelphia’s longest-operating book stores. 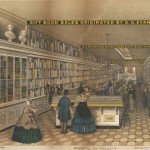 Bookstores thrived in Philadelphia during the nineteenth century, as literacy rates continued to climb and reading became an important part of American self-improvement efforts. 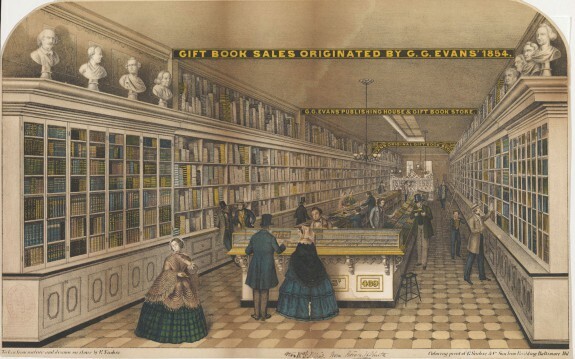 The era’s bookselling luster can be found in this 1859 lithograph of the stylishly appointed George G. Evans store at 439 Chestnut Street. The illustration is the work of Edward Sachse, a German artist who resettled in the United States and with his brother founded E. Sasche & Co. in Baltimore. 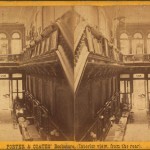 This stereographic photograph shows the interior of Porter & Coates Bookstore, taken from the very back of the store’s interior. The company was founded originally as “Davis & Porter Co” in 1848 by Robert Porter and Charles Davis. It would be renamed “Porter & Coates” in 1867 after Henry Coates joined the company and Charles Davis retired. Stereographic photos, like this one, started to become popular in the mid-nineteenth century and were captured by a camera with two apertures, set side-by-side. When inserted or held behind a special viewing device with mirrors (known as a stereoscope viewer), the two photographs appeared to combine and create the illusion of three-dimensional perspective for the viewer. Stamped text on the back of the photograph credits James Cremer’s Stereoscopic Emporeum. Cremer’s subjects included locations such as Fairmount Park, Independence Hall, the Schuylkill River, and the University of Pennsylvania, as well as stereographic portraiture. As of 2016, Joseph Fox Bookshop was the oldest operating bookstore in Philadelphia, having opened in 1951. In an era when large chain stores drove many independent bookshops out of business, Joseph Fox drew customers by hosting events and introducing online sales in addition to its store at 1724 Sansom Street. Bookstores have long been an important part of the economic and cultural fabric of Philadelphia. As early as the eighteenth century, booksellers set up shop in the city, eager to serve a highly-educated population hungry for information. In the nineteenth and early twentieth centuries, the number of bookstores continued to rise. These stores sold a wide variety of titles, from the latest best sellers to rare first editions. During the last quarter of the twentieth century, however, bookselling began to change in significant ways. 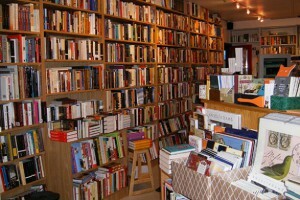 The growth of chain bookstores, and, later, the Internet, resulted in the closing of independent bookstores across the region. In colonial America, many printers were also booksellers. Bookselling helped provide the capital that men like William Bradford (1663-1752), Benjamin Franklin (1706-90), Thomas Dobson (1751-1823), and Mathew Carey (1760-1839) needed to finance their printing and, later, publishing operations. During this period, booksellers imported most of their stock from Europe. Religious texts, almanacs, and schoolbooks sold particularly well. Booksellers also sold stationery and other items. One of Philadelphia’s earliest bookstores was run by the Martinique-born author Médéric Louis Élie Moreau de Saint-Méry (1750-1819), who first came to Philadelphia to escape the violence of the French Revolution. He opened his shop at Front and Walnut Streets in 1794, selling a variety of foreign-language books. His bookstore quickly became a center for the French expatriate community in the city. Bookstores thrived in Philadelphia during the nineteenth century, as literacy rates continued to climb and reading became an important part of American self-improvement efforts. Although several local publishers, such as J.B. Lippincott & Co., ran retail stores, as the century progressed bookselling became largely independent from printing and publishing. 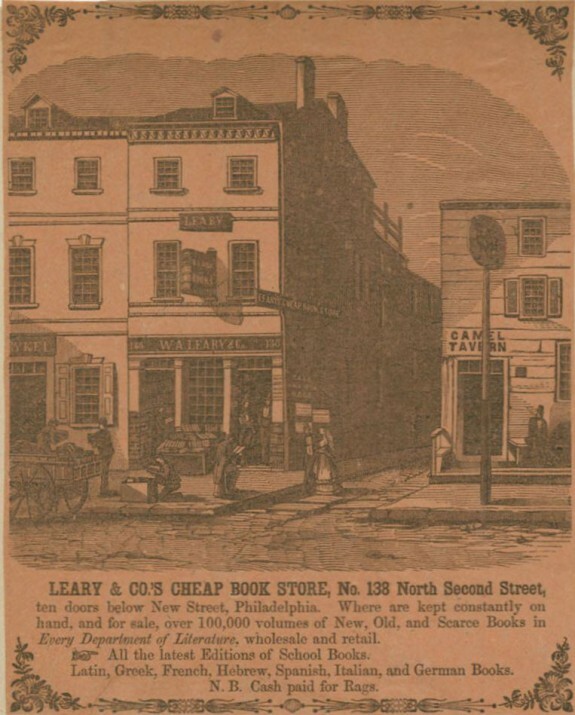 Leary’s Book Store, founded in 1836 by Maryland-born William A. Leary (1816-65), became one of the city’s most popular places to buy books. The store, which had several locations including 138 N. Front Street (1836), Fifth and Walnut Streets (1868), and 9 S. Ninth Street (1877), did not gain prominence until it was taken over by former employee Edwin S. Stuart (1853-1937) in 1876. Leary’s became known for its large stock of used books as well as for its distinctive sign, which featured an older man on top of a ladder with his hands full of books. In 1891, Stuart became mayor of Philadelphia, and, in 1907, he became governor of Pennsylvania. Stuart’s brother, William H. Stuart, took over the operation of the store. Under William, Leary’s continued to thrive. Writer Christopher Morley (1890-1957), who frequented the shop, used it as the inspiration for his mystery novel The Haunted Book Shop (1919). By 1950, Leary’s was selling almost 40,000 books a week. The store closed in 1968. Beginning in the late nineteenth century, books could be found not only in bookstores but also in department stores as well. John Wanamaker (1838-1922) started selling a few children’s books in his Philadelphia store in 1877. By 1884, he was selling $10,000 worth of books a day. He even published the monthly magazine Book News to advertise his offerings. Before long, other Philadelphia department stores began selling books, including Gimbels, Strawbridge and Clothier, and Snellenburg’s. During the twentieth century, women became more prominent in the bookselling business. One advocate for women in bookselling in the region was Georgiana Hall, who worked for Wanamaker’s. In 1914, Hall gave a speech on the subject in front of the Philadelphia Booksellers’ Association. Hall argued that in addition to careers in teaching and librarianship, college-educated women should also consider bookselling. Another important woman in the bookselling business was Elisabeth Woodburn (1912-90). Woodburn sold books out of her farmhouse in Hopewell, New Jersey, where she specialized in agricultural and horticultural books. Woodburn was a founding member of the Antiquarian Booksellers’ Association of America (ABAA) and later became the group’s president. Woodburn was one of many antiquarian booksellers who clustered in and around Philadelphia in the early twentieth century. Perhaps the most famous was A.S.W. Rosenbach (1876-1952), who started the Rosenbach Company at 1320 Walnut Street in 1903. Known for offering extremely rare books, including Gutenberg Bibles and Shakespeare Folios, Rosenbach sold to some of the richest men in the United States, including Henry E. Huntington (1850-1927) and Henry C. Folger (1857-1930). Rosenbach and his brother Philip Rosenbach (1863-1953) established the Rosenbach Museum and Library in 1954 to showcase their personal collection of books. In 2013, it became part of the Free Library of Philadelphia. One of Rosenbach’s neighbors and competitors, the Vienna-born bookseller Charles Sessler (1854-1935), opened his shop on 1314 Walnut Street in 1906. Sessler sold all sorts of rare books, but he specialized in the work of Charles Dickens. Sessler’s assistant, Mabel Zahn (1890-1975), began working at the store when she was only fifteen years old and took over the store when Sessler died. Zahn became president of Sessler’s in 1955. The 1960s and 1970s brought new energy to Philadelphia, with the growth of the counterculture and new social movements. The city’s bookstores reflected these changes. Robin’s Book Store was founded by David Robin (1901-74) in 1936 at 21 N. Eleventh Street. Eventually moving to 6 N. Thirteenth Street, Robin’s gained notoriety in the 1960s as one of the few bookstores in the city willing to sell Tropic of Cancer by Henry Miller (1891-1980). Many people considered the book controversial because of its sexually explicit content, and the city’s district attorney tried to ban bookstores from carrying it. Robin’s refused and ended up selling 7,000 copies in one week. In 1980, Robin’s moved to 108 S. Thirteenth Street. The store closed in 2012. Other bookstores served specialized audiences. New World Book Fair was located at 113 S. Fortieth Street in West Philadelphia. Opened by William H. Crawford (1911-2002) in 1961, the store sold Marxist and African American books and became known as a gathering place for local activists. It closed in 1974. Giovanni’s Room, one of the first gay book shops in the United States, opened in Center City in 1973. Founded by Tom Wilson Weinberg (b. 1945), Dan Sherbo (b. 1950), and Bern Boylethe (1951-92), the shop took on an especially important role during the AIDS epidemic of the 1980s, when it sold books about HIV that could be found nowhere else. In 1975, activist Sheila Lee Goldmacher (b. 1934) helped found Alexandria Books, Philadelphia’s first lesbian and feminist bookstore. The shop closed two years later. Two other important activist bookstores that were founded during this time were House of Our Own, which opened in 1970 at 3920 Spruce Street, and Wooden Shoe Books, which opened in 1976 at 112 S. Twentieth Street. Beginning in the 1980s, independent bookstores in the Philadelphia region faced stiff competition from large chain bookstores like B. Dalton, Waldenbooks, Barnes & Noble, and Borders, which could afford to heavily discount their books. During this period the Booksellers’ Association of Philadelphia, which had 250 members in the 1950s, disbanded. By the 1990s, the online retailer Amazon.com began offering books for even lower prices. Many independent bookstores closed, but others managed to find their niche. Joseph Fox Books was founded in 1951 by Madeline and Joseph Fox in Rittenhouse Square. 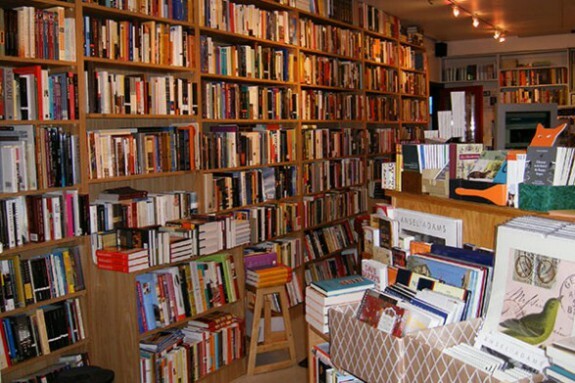 In the mid-1990s, the store, which by then had moved to 1724 Sansom Street, started hosting authors’ events to draw readers to the store. As of 2016, it was the oldest independent bookstore in the city. 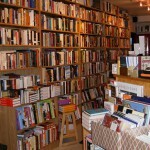 Despite the dominance of Amazon.com and the rise of ebooks, the opening of several new independent bookstores, including Big Blue Marble Bookstore and Port Richmond Books, continued to make print books available to Philadelphia readers. Allen, George. Four Talks for Bibliophiles. Philadelphia: Free Library of Philadelphia, 1958. Boynton, Henry Walcott. Annals of American Bookselling, 1638-1850. New York: J. Wiley & Sons, 1932. Breig, Jean H. “Philadelphia Book Stores.” Library Journal 80:9 (1955): 1050-1054. Brotherhead, William. Forty Years Among the Old Booksellers of Philadelphia.Philadelphia: A.P. Brotherhead, 1891. Dickinson, Donald C. Dictionary of American Antiquarian Bookdealers. Westport, Conn.: Greenwood Press, 1998. Jackson, Joseph. An Old Landmark: A Famous Bookstore. Philadelphia: Leary’s Book Store, 1920. Rosengarten, Joseph G. “Moreau de Saint Mery and His French Friends in the American Philosophical Society.” Proceedings of the American Philosophical Society 50/199 (1911): 168-178. Stern, Madeleine B. Antiquarian Bookselling in the United States: A History from the Origins to the 1940s. Westport, Conn.: Greenwood Press, 1985. Wolf, Edwin. 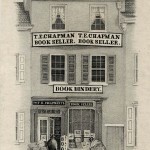 The Book Culture of a Colonial American City: Philadelphia Books, Bookmen, and Booksellers. New York: Oxford University Press, 1988. Wolf, Edwin. Rosenbach: A Biography. Cleveland: The World Publishing Company, 1960. Charles Sessler Records (1908-78) and Jeremiah Cullen Collection, Historical Society of Pennsylvania, 1300 Locust Street, Philadelphia. Leary’s Book Store Records (1840-1969) and William J. Campbell Bookstore Records (1833-1955), Special Collections Research Center, Temple University Libraries, 1210 Polett Walk, Philadelphia. Rosenbach Museum and Library, 2008 Delancey Place, Philadelphia. Joseph Fox Bookshop, 1724 Sansom Street, Philadelphia. Blue Marble Bookstore, 551 Carpenter Lane, Philadelphia. Port Richmond Books, 3037 Richmond Street, Philadelphia. House of Our Own Books, 3920 Spruce Street, Philadelphia. Wooden Shoe Books, 704 South Street, Philadelphia. Good article – remember William Crawford’s shop on 40th St with affection; could certainly add George Allen’s bookstore on the 2100 block of Walnut which was a major attraction into the 1980s; the other big seller was of course Freeman’s Auction House which moved whole libraries.